The Minor Planet Center web site, a Smithsonian Operation, so pretty serious stuff, lots of info, just a scan of the lists could alter your view of the local environs we live in. 1200 plus potential dangerous asteroids….known and in the inner system today, tens of thousands of other bodies out there, ready to play interplanetary billiards if something really hairy this way came. But mainly a very good resource for serious thought, serious business like eSpace objectives for mining, and for not so serious ventures such as SciFi. 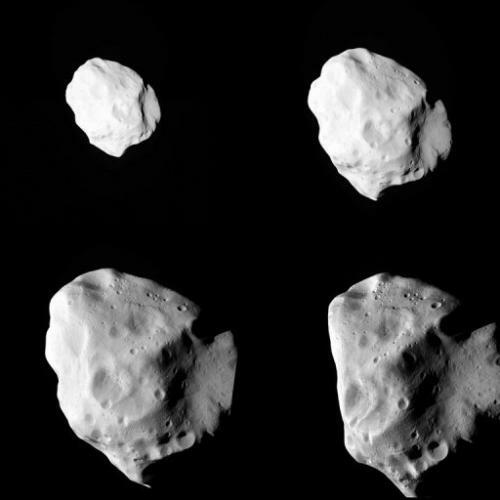 A combo shows a sequence of images of the Lutetia asteroid at various distances before the closest approach of the Rosetta spacecraft in 2010. A rare opportunity to observe an asteroid at close quarters has unveiled a remarkable rock that seems to be a precursor of a planet, astronomers reported on Thursday. This is Eros the first asteroid to be visited, “34.4×11.2×11.2 km in size 34.4×11.2×11.2 km in size” “Mean density 2.67±0.03 g/cm³ ” or about 2670 kilos per cubic meter. 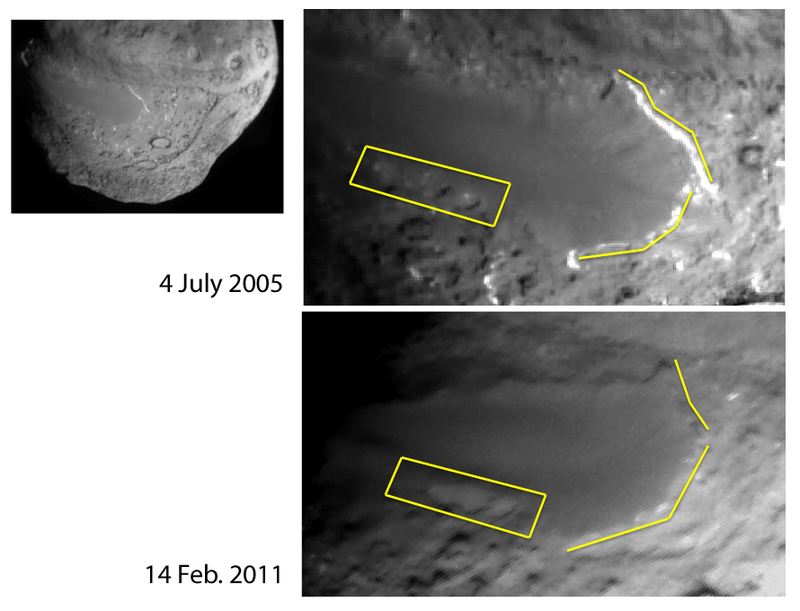 Below is Temple, a comet visited by two spacecraft. “Mean density 0.62 g/cm³ ” or 620 kilos per meter. With this information it becomes obvious that the make up of the minor worlds is much more diverse than had begun to be thought. Eros is pretty dense but still probably filled with voids, obviously Temple is pretty much a rubble pile, which astronomers think is true of other bodies. So Lutetia is too dense to be a rock pile or even void filled, it has to be as solid as a planet, they think it’s a left over planetesimal from the early creation of the solar system. The only way it can be as dense as it is, is if it went through a molten phase. Given that a shell even a ‘few’ miles thick of rock provide a good insulator it is apparently possible that Lutetia has a molten core. Does that mean there could be differentiated materials in that crunchy coating? It seems to be an obvious target for mining, where there is pretty much zero risk of cave ins. What are the odds of a good distribution of useful materials for the space industrial infrastructure? This may or may not be a valid mining target, but it points out some things to think about. This entry was posted in eSpace, Future, Space, Tech and tagged commercial space, Future, Space by Sci Fi Engineer. Bookmark the permalink.